Fusarium crown and root rot means death for asparagus. Heavy soil, poor drainage, over-harvesting, and insect feeding all work to create the perfect habitat for this ubiquitous fungi. Fusarium is a large fungal family that causes several different disease in many garden plants. You may have already heard of Fusarium wilt, but there are several different crown and root diseases caused by these pathogens. One version attacks pumpkins, melons, and other cucurbits. Another group of Fusarium fungi attack asparagus. Rather than having a single cause, there are three different forms of the Fusarium fungi that cause this fungal disease of asparagus. This trio of Bad Guys go by the names Fusarium oxysporum f. sp. asparagi, F. verticilliodes, and F. proliferatum. [Don’t worry, there won’t be a quiz.] All three fungi colonize the roots and crown, and the first one listed can also infect xylem tissue. Asparagus plants infected with the Fusarium fungi decline over time. At first, you may see one or more stunted, bright yellow ferns. This bright yellow coloration is a warning flag that should not be ignored. Wilting is also common. If you look at the crown area, you will see reddish brown discoloration. At this point, it is a good idea to pull the plant up, for closer inspection. Cut open the crown or below ground area of the plant, to see if sunken brown lesions or reddish flecks are present. Then, look closely at the roots. Infected plants will have reddish brown, elliptical lesions on the storage roots. Feeder roots will probably rotted off completely, though any remaining tendrils will have the same reddish brown discoloration seen elsewhere. Unfortunately, these fungi can survive in the soil indefinitely, and they are found pretty much everywhere. The disease is often spread as infected soil is moved from place to place on shoes, tools, and equipment. It can also be carried on seeds, which is why choosing reliable seed sources is so important. This disease can occur anywhere underground. Very often, insect feeding creates points of entry for these fungi. Asparagus miners are a common culprit. Once a plant becomes infected, it should be removed completely, along with nearby soil, and disposed of in the trash. To reduce the chances of the disease taking hold in the first place, your asparagus plants should be rotated every five years and be sure to provide proper drainage. Remember, perennial asparagus can provide you with many years of delicious spring and autumn spears, so don’t let these pathogens stop you from trying to grow your own! Parsley - it’s not just for restaurants any more. As a kid, I always turned a suspicious eye toward that sprig of greenery on my plate. My mother urged me to try it, so I did. Unfortunately, my young taste buds were not impressed. The mildly bitter bite of parsley was not my idea of delicious until many years later. Now that my taste buds are older and wiser, the refreshing tang of parsley adds a bright balance between flavors, cleanses the palette, and spices things up. If that weren’t reason enough to add parsley to a landscape, parsley packs one heck of a nutritional punch and, hey, it looks nice in the garden! Parsley is a central Mediterranean plant, which means that it grows well in California, as long as it is protected from our scorching hot summers. Parsley makes an excellent shade garden or container plant. You can even grow it on your kitchen window sill for easy access and nice color if you have strong enough sunlight. Parsley is related to celeriac and celery, which explains its Latin name (Petroselinum crispum), which means ‘rock celery’, but it’s a heck of a lot easier to grow than celery. Parsley prefers well-drained soil that is kept moist, but my plants seem to grow under just about any conditions. In spite of my heavy clay soil, I have several parsley plants that thrive under roses, trees, and shrubs. Research has shown that parsley also repels asparagus beetles, making it a good companion to asparagus and tomato plants. Growing parsley does require some patience if you are starting from seed. Seeds should be planted 1/2 inch deep, 6 inches apart, and they can take 4 to 6 weeks to germinate. Germination rates are pretty high, so growing parsley from seed is the most cost effective method. While you’re at it, plant some extras and give young plants to family and friends as gifts! Parsley plants allowed to go to seed provide habitat, pollen, and nectar to honey bees and many other beneficial insets, some swallowtail butterflies, and even goldfinches.You will probably also end up with many free, randomly placed parsley plants next year! If flavor and looks weren’t reason enough to grow your own parsley, the CDC says it’s a nutritional gold mine. They ranked parsley at #8 as a food that reduces chronic diseases, such as cancer, coronary disease, and osteoporosis. To learn more, check out the U.S. Dept. of Agriculture’s nutritional analysis website that allows you to look up the nutritional value of pretty much any food. Just 10 sprigs of parsley provides 22% of the RDA for Vitamin C and 200% of Vitamin K.
It’s pretty. It’s durable. It’s good for you. And it tastes good. April is an excellent time of year to start planting asparagus. Now, growing asparagus is not a task for the impatient. You will not get a crop the first year. You won’t get a crop the second year, either. However, those succulent stalks are certainly worth the wait. Plus, you will continue to get crops, year after year! Asparagus was offered to the Egyptian gods over 5,000 years ago, and people have been enjoying it ever since. Unlike many of our vegetable crops, asparagus grows from crowns, which are food storage rhizomes. The familiar spears, left to their own, will open up and grow into ferny branches that can reach 4-5’ in height. Asparagus leaves are actually modified stems, much like conifers. The root system is adventitious. Yellow to greenish-white flowers emerge and become red berries when fertilized. Before you starting planting asparagus, give the site some thought. Asparagus plants may take a few years to really start producing, they will continue to produce for 20-30 years or more! Asparagus loves raised beds in full or partial sun, and lots of compost-rich soil. Asparagus does not compete well against weeds, so be sure to keep the asparagus bed weed free. Mulching will help a lot. One year old crowns are the best way to start. Dig a trench 12” deep in the bed and place asparagus crowns 18” apart. Spread the roots out, cover with soil and water, but do not fill in the trench. Watch for new growth. As shoots begin to appear, add more soil, repeating until the trench has been filled. If you want to grow asparagus from seed, the seeds must be germinated between damp paper towels and then gently transferred to soil. Keep the asparagus bed consistently moist, but not soggy. While spears may appear the first year or two, force yourself to ignore them. Allow the plants to go through their annual cycle. This will help them develop a strong root system, necessary for long term production. 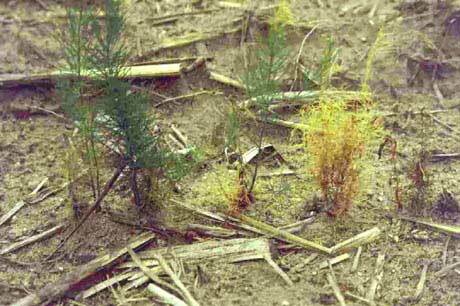 Asparagus is susceptible to Fusarium wilt and asparagus rust. Remove and discard diseased shoots. Aphids can also become a problem. To get rid of the aphids, simply spray the plants with the hose. By the third year, you should be able to harvest some, but not all, of the spears. They taste the best when they are 5-7” tall. Cut or snap the spears off at or near ground level. By late spring or early summer, your asparagus harvesting season is done. Allow any spear that come up to complete their normal cycle. If you end up with a bumper crop of asparagus, you may be tempted to eat it all. This might be a bad idea. Eating a lot of asparagus can make urine smell pretty awful. Instead, the shoots can be pickled and stored for several years. They taste particularly good in a Bloody Mary.